Rolls-Royce dropped out of the race to power Boeing's planned mid-market aircraft on Thursday, saying it did not want to risk more disruption for its airline customers by rushing out a product without extensive testing. Star Alliance is thinking beyond air. It is exploring technologies that will allow frequent flyers to redeem miles not just for flights and upgrades but home stays, tours and activities, even underground train tickets. Italian Deputy Prime Minister Luigi Di Maio said he sees no risk of failure for talks with EasyJet Plc and Delta Air Lines Inc. to relaunch struggling airline Alitalia SpA. Fiji's National Airline, Fiji Airways, has announced a codeshare arrangement with Japan Airlines. IAG SA ordered 18 Boeing Co. 777-9 jets worth US$8 billion for its British Airways arm in a setback for Airbus SE, which had also been competing for the deal. Vietnam Airlines, the fastest growing carrier in Southeast Asia and Sabre Corporation (NASDAQ: SABR), the leading technology provider to the global travel industry, were joined by President of the United States of America Donald Trump, and President of the Socialist Republic of Vietnam, General Secretary of the Communist Party of Vietnam Nguyen Phu Trong, at the Presidential Palace in Hanoi, for the signing of a memorandum of understanding (MOU) between Sabre and Vietnam Airlines and its subsidiary. Cathay Pacific Airways Ltd., Asia's biggest international carrier, is studying a bid for stakes in two smaller Hong Kong airlines backed by embattled Chinese conglomerate HNA Group Co., people with knowledge of the matter said. 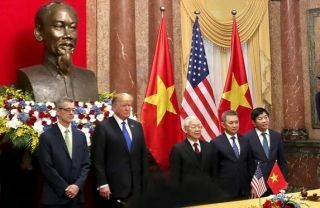 Vietnamese President Nguyen Phu Trong and U.S. President Donald Trump witnessed here on Wednesday the signing of several business deals, including two on the sales of Boeing jets to VietJet Air and Bamboo Airways. Chinese express delivery giant SF Holding Wednesday announced that its net profits for 2018 fell 4.57 percent from the previous year on rising costs and new business expansion.